We're not sold on the Sony systems' muddy sound, but we'd take the extra-cost speakers bundled with MyFord Touch and settle in for a long learning curve. 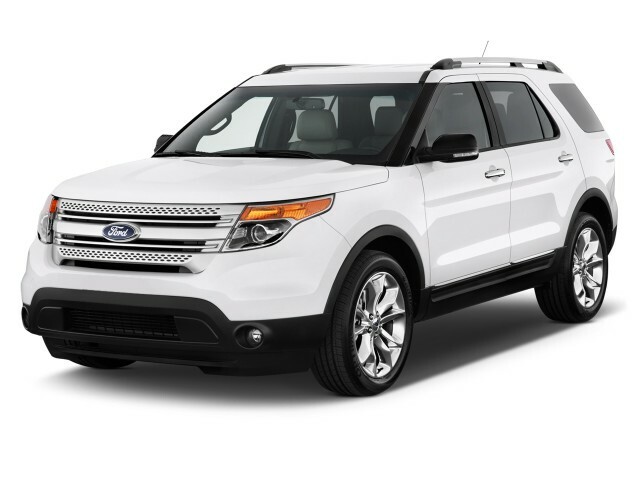 The 2014 Ford Explorer does build on its heritage, but on-road fluency and passenger comfort are clearly at center stage. 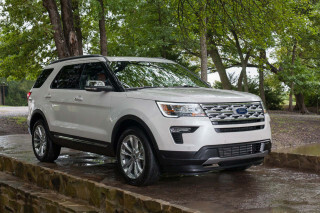 The 2014 Ford Explorer, now in its fourth year as a large crossover utility vehicle, continues to be both one of the best-known U.S. nameplates and a strong seller among those who need seven seats and a lot of interior volume. The original high-volume SUV for Ford has evolved, along with American family needs, and today the Explorer share much of its underpinnings with Ford's big sedans, as well as the Ford Flex large wagon. That might not be the right stuff if you need to cross the Rubicon it's just right for all-weather family transit. The Explorer offers plenty of room for lots of people, or lots of stuff, and it does it much more efficiently than it did in previous generations based on trucks. And it still retains some mud-running bona fides too--even if they probably were only ever weekend ambitions for most of their suburban owners. Simply put, for almost everything a family would throw at the 2014 Ford Explorer, it does it better than before--and it does what the wide majority of us need to do in a crossover. In style, the Explorer doesn't turn away too abruptly from the past. Inside it does its best impression of a Taurus sedan in look and feel, albeit a little more upright. Performance is buttoned-down, almost to sport-wagon standards, with predictable, benign handling and available all-wheel drive. The 3.5-liter V-6 that's offered through most of the lineup is plenty quick, while the front-wheel-drive Explorer with an EcoBoost four is best kept for those who seldom if ever take advantage of this vehicles spacious seating. The Explorer Sport is a different personality--very quick, taut, and faster than any V-8 Explorer of the past; it's a crossover extension of the Taurus SHO, essentially. The 2014 Ford Explorer has one of the most spacious interiors on the market--especially if you judge it by passenger space. Up to seven passengers can fit, and five adults will be fine in the front two rows. Getting into the third row is a little tougher than it is for the Ford Flex, as the Explorer sits taller. Every inch of this interior seems to be designed with family use in mind, and a power tailgate and power-folding seats are there to make it more convenient. Those carlike underpinnings mean that the 2014 Explorer can't quite hit the trails with the likes of the Grand Cherokee. But on-the-road handling is its forte, and it has quick, well-weighted steering plus terrific ride control, thanks to its substantial curb weight and an independent suspension. Highway miles truly are its friend. That doesn't preclude it from getting dirty now and then. 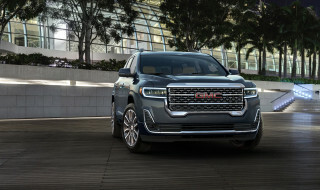 A Terrain Management system controls stability and other systems to limit wheelspin while maintaining a 5,000-pound towing capacity. It's definitely Explorer Lite compared to the distant past, but it's still quite capable, in the wider view. Going by safety, the Explorer is one of the safest vehicles Ford builds, with inflatable rear seat belts and rearview cameras and blind-spot detectors. It also woos gearheads of another kind with MyFord Touch, the convoluted but promising system that uses voice, button or touchscreen control to govern infotainment and other vehicle functions. For 2014, second-row heated seats and adaptive cruise control are newly available on the Limited, and automatic headlamps have been made standard. The 2014 Ford Explorer gives homage to the past, but only on the outside; inside, it's one of Ford's best interiors yet. From the 1990 original all the way to the current 2014 Ford Explorer, the shape of this American family vehicle has evolved quite profoundly--in several distinct generational cutoffs. Today's model honors that original, yet you can't ignore that it has carlike details woven in everywhere. While the former version was a trucky ute trying to look a bit more carlike, this is eseentially the opposite. Up close, you'll see that the Explorer hits some high points of crossover SUV style. It's a dialect of sharp angles and straight lines, the opposite of softly rounded wagons like the Volvo XC90 (actually a distant cousin to it). The Explorer's visual DNA may be purely on loan here, but the tall body, big glass areas and the three-bar grille peg it as a Ford as much as its outline. The high-performance Explorer Sport makes the most of the car-like side of its persona, with glossy black trim, 20-inch wheels, and mesh grille inserts. It has more in common with a Taurus SHO than with a big Expedition SUV, down to winged taillamps and a perforated grille, but the Explorer still avoids looking like a sedan or a minivan. Inside, the current Explorer makes no attempt to give nod to the past--and that's perfectly fine. Early Explorers had miserable, plasticky interiors, which got better as it was groomed upmarket. 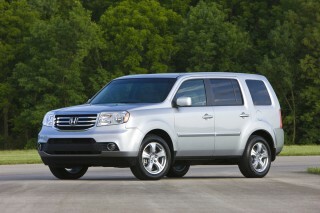 Nevermind the ungainly dashes in the Honda Pilot and Toyota Highlander. It's up there with the Jeep Grand Cherokee and Dodge Durango in tailored good looks, with maybe a half-degree more of the contemporary in its win column, thanks to those exclamation points of metallic plastic on the center stack. Audi and BMW are in its crosshairs, Ford says, and the Explorer delivers, in almost the same way the Flex and F-150 do. The cabin's a knockout, smoothing off transitions between dissimilar plastics and putting the curvy goodness into an interior that could have been confused for a shoe-store stockroom, in the past. On the road, the 2014 Explorer is quick and confident, with good straight-line acceleration and carlike handling. Forget about the Explorer being somewhat related to pickups; that's already several years in the past. The Explorer's now based on a set of Volvo-derived car mechanicals that underpin lots of Ford models, from the Taurus sedan to the Flex and Lincoln MKT crossovers. 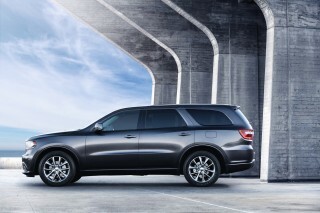 At its core the Explorer is a front-driver, with an option for all-wheel drive. The predictably safe, typically benign tall-wagon handling doesn't vary too much from model to model--but the powertrains do. Are Ford Explorer owners going to venture very far off road? Ford has chosen wisely here, in trading off some of the Explorer's potential off-road ability and towing capability for big gains in gas mileage, handling, and ride comfort. Considering the way that owners actually use Explorer models--and have for decades--it's right in tune with respect to performance. The standard engine on the Explorer is a 3.5-liter V-6, shared with many Ford vehicles, from the Edge to the Flex. 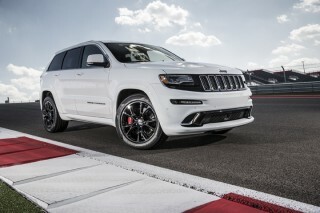 With 290 horsepower, it's good for mid-eight-second 60-mph acceleration through a six-speed automatic transmission. If it sounds pedestrian, it's good to recognize that the six-cylinder's far more powerful on paper than the the V-8 in the prior edition. Acceleration from a stop is strong, and most models have a sport-shift mode for quicker throttle and shift responses, but these Explorers don't get shift paddles to go with the automatic. The transmission will hold lower gears when told, though, and that alone makes it more responsive than almost any competitive crossover. In the name of gas mileage, there's another option. A 2.0-liter turbocharged four-cylinder with 240 horsepower and 270 pound-feet of torque actually has more torque than the 255 lb-ft available with the V-6, yet it's a little less certain if you plan to haul a heavy load of passengers around on a regular basis. If you're the solo-commuter type, it's a $1,000 option that will actually pay off for itself pretty quickly, as it's rated at 20/28 mpg. Overall, this engine makes some grouching, flapping turbocharger noises that upset the Explorer's more refined demeanor. Paddle-shifters would have made this combination more drivable than it is, but they're not included; and keep in mind that towing capacity slides to 2,000 pounds. Last year Ford introduced a new 350-horsepower, twin-turbo-V-6 Explorer Sport model; it's offered only with all-wheel drive and gets a raft of changes to go with its exceptional power (Ford says it's two seconds quicker to 60 mph than the standard six-cylinder model). Consider this a utility-vehicle version of the Taurus SHO; it gets quicker steering, 20-inch wheels and tires, upgraded brakes, and a stiffer front body structure. 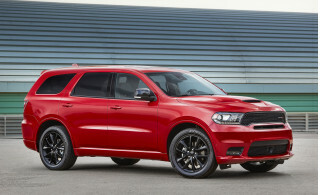 The Sport is far more fired up than the old Explorer V-8; just don't expect it to chase a Grand Cherokee SRT8. In its basic front-drive versions, the Explorer's electric power steering and terrifically settled ride give it a nimble feel that's more like that of the smaller Edge. The Explorer carves into corners with zeal, and the steering unwinds with a feel that's closer to natural than some hydraulic-steer vehicles. The electric steering also means the Explorer can park itself--with the Active Park Assist options, which uses cameras to maneuver the steering while the driver keeps tabs on things with the brake pedal. The 2014 Explorer can slosh through enough mud and ruts to get a family of seven to any ski resort or any bed and breakfast that doesn't require an overnight National Park Service permit. If you're arguing over the lack of a low-gear ratio and frame rails and skid plates, you're less likely to have been shopping an Explorer in the first place. There's a multi-traction drive system that spins from Normal to Mud and Ruts, Sand, and Snow modes, tailoring power and braking to suit the conditions. In esoteric instances, those electronics can't quite match a really well-trained off-road driver, since they require a little slip in the system to start working. For the remaining 95 percent of us, it's welcome relief to worry less about descending a hill with brake and engine modulation instead of simply flicking a switch. A comfortable ride and great front seats provide much to be happy about, although third-row passengers will feel a little left out. Space is really no problem in the 2014 Ford Explorer. It comes configured only as a seven-passenger wagon, and leaves five-passenger duties to the smaller Edge--and a sleeker, more urbane definition of three-row transportation to the Ford Flex. Across the lineup though, there's excellent headroom and front-seat comfort to go with flexible cargo capacity. Perhaps it was a parting gift from Volvo, or the studying of driver fatigue has paid off: Ford has finally learned how to make more comfortable, supportive front seats, and the 2014 Explorer has them. Softer cushions are paired with just enough side bolstering where you need it, and the seats are power-operated with heating control. Head room soars in front and the middle row of seats, even with the sunroof option ticked, and the wide center console doesn't cut into knee room very much. In the second row, there's room for a child between two adults on the bench seat. Knee room is fine, head room is great--but the bottom cushion of the seat could be better tailored. It's short and angles down at its front edge. A pair of buckets can be ordered for the second row, and have the same cozy feel as those up front--without the optional ventilation, though. The third-row seat is pretty cramped for adults, but it's more than adequate for children, who can climb into the narrow space created when you flip the middle row forward via an easy lever. For cargo duty, the Explorer comes with a fold-away third-row seat, power-operated if you want. Power or fold the back seat and the middle seats, and the Explorer lays bare 81 cubic feet of cargo volume--almost all of it available for big, flat packages, since the seats fold nearly flat and wear an invulnerable grade of carpeting on their backs. With 21 cubic feet of space with the third row occupied by people, the storage space is fairly large, and lined with durable if inexpensive-looking plasticky material. Mostly top safety scores from both agencies--plus a huge array of active-safety options--adds up to one of the safest models on the market. It's absolutely no exaggeration to call the Ford Explorer one of the safest models on the road. With a stout body structure plus a slew of safety technologies, the 2014 Explorer makes a serious appeal to those who want the best occupant protection, along with some potentially useful accident-avoidance tools. The Explorer has earned top scores in both of the major crash-test programs. The Insurance Institute for Highway Safety (IIHS) named it a Top Safety Pick, including a "good" score on the roof-crush test--although it hasn't yet been tested in the new small-overlap frontal test. And it's earned five stars overall in the federal tests--with five-star scores in all the subcategories except for the mathematically determined rollover score. The 2014 Ford Explorer has a special "curve control" feature for its stability control, which adapts throttle and brake to upcoming corners; trailer-sway control also helps make maximum use for its 5,000-pound towing capacity. Optional inflatable rear-seat belts, which come bundled with blind-spot monitors. Every Explorer comes with great outward visibility, thanks to a high seating position, except to the rear quarters where thick C-pillars create a rather large blind spot. Bluetooth hands-free connectivity is standard, as is a rearview camera. And MyKey lets parents set volume and speed controls for kids who may borrow the Explorer. How much are you willing to spend? The 2014 Ford Explorer can be just comfortable, or downright luxurious. Don't even try to compare the features in the 2014 Ford Explorer to what you'll get in the Toyota Highlander or Honda Pilot. 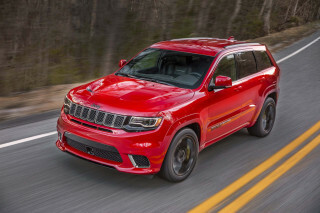 It offers one of the widest, most technologically advanced set of features available in its segment--even more than some luxury models, really--and it's in a tight race with the Jeep Grand Cherokee for packing loads of convenience features in a relatively affordable family vehicle. Each Explorer comes with all the standard features you'd expect to find in a $30,000. It has power windows, locks, and mirrors; cruise control; steering-wheel audio controls; a tilt/telescoping steering wheel; and an AM/FM/CD player with an auxiliary jack. The Explorer XLT adds on 18-inch wheels; satellite radio; a sport-shift mode for the automatic transmission; and reverse parking sensors. The Explorer Limited runs around $40k but gains leather seating; pushbutton start; ambient lighting; a Sony sound system; a media hub with twin USB ports (one for 3G or 4G dongles that turn the Explorer into a mobile WiFi station), an SD card slot and RCA jacks; power-adjustable pedals; SYNC and MyFord Touch; and a rearview camera. Other Explorer options include a power sunroof; a heated steering wheel; automatic headlamps; navigation system; premium audio; 20-inch wheels; ventilated seats; active park assist; and a power third-row seat. Inflatable rear seat belts now come in a package with blind-spot monitors. The Ford Explorer Sport offers a turbo V-6 drivetrain, with standard all-wheel drive and Terrain Management. Along with its own wheels and styling filigrees--the "Explorer" name across the nose and 20-inch wheels--the Sport adds standard SYNC, MyFord Touch, and a media hub with dual USB ports, an SD card slot and a set of RCA jacks. Safety equipment includes a standard rearview camera and options for blind-spot monitors, active park assist, and a set of inflatable rear seat belts. As for luxury touches, the Explorer Sport has power front heated seats; automatic climate control; and a Sony audio system with HD radio and 12 speakers. Options include a navigation system; a DVD entertainment system; remote start; rear heated seats; a dual-pane sunroof; a power tailgate; a tow package; active park assist; blind-spot monitors; inflatable rear seat belts; and adjustable pedals. For 2014, some of the Sport's feature set is being expanded to Limited models. Second-row heated seats and adaptive cruise control are newly available on the Limited, and automatic headlamps have been made standard. One feature that you'll need to come to terms with if you're considering the Explorer is MyFord Touch--a complex and controversial system in any Ford. The idea is to trade buttons and switches for LCD touchscreens, voice commands, and steering-wheel controls, so that drivers can run functions like audio or navigation more safely. Not only does it take time getting used to, the benefits of the system don't emerge after short stints at the wheel. The good news is that it's not mandatory; it remains an option on lower-trim Explorers--and if you merely want Bluetooth connectivity, that's well-integrated on those affordable models. The stock V-6 in most of the 2014 Explorer lineup is typical for the class, but the turbo four angles at efficiency-minded families. It's very likely that if you're looking at a seven-passenger, three-row crossover like the 2014 Ford Explorer, gas mileage isn't a top priority. But if you're okay with only somewhat slower acceleration, there's a more efficient option. 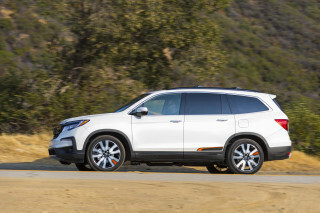 A turbocharged, direct-injected, 240-horsepower four-cylinder earns estimated EPA ratings of 20/28 mpg, or 23 miles per gallon combined--about 25 percent higher than the last-generation Explorer did in base form. It's optional, and only available in front-drive form. The other caveat is that it's only rated to tow up to 2,000 pounds, not the 5,000 pounds the V-6 Explorer can. The base V-6 Explorer has gas mileage more in line with other seven-seat family wagons. With the 290-horsepower, 3.5-liter V-6 and six-speed automatic, it's rated at 17/24 mpg or 20 mpg combined; with all-wheel drive, it's pegged at 17/23 mpg and 19 mpg combined. Separately, there's the twin-turbo Explorer Sport, which drops the numbers to an EPA-rated 16/22 mpg or just 18 mpg combined. Although it's by no means green or fuel-efficient, it's better than former V-8 Explorers. A truly great car. 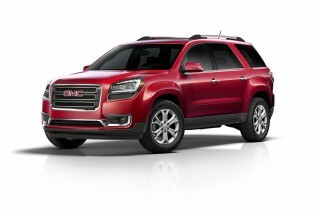 If you an ant an awesome SUV that can handle and go...., get the Sport! Plenty of upgrades and great quality.